Ahoy, mateys! 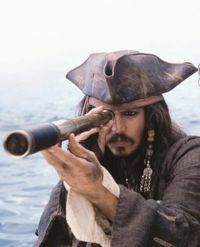 'Tis a plethora o' pirates we be lookin' at in 2011! 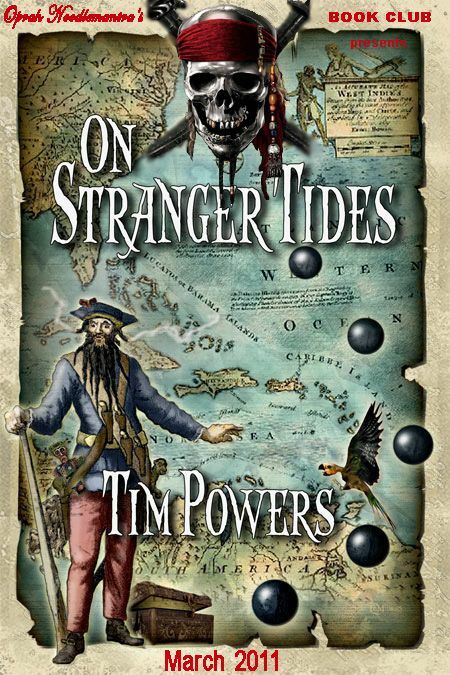 "On Stranger Tides is a 1988 historical fantasy novel written by Tim Powers. It was nominated for the World Fantasy Award for Best Novel and the Locus Award for Best Fantasy Novel. This book follows the exploits of John "Jack Shandy" Chandagnac, who travels to the new world after the death of his puppeteer father to confront his uncle, who apparently has made off with the family inheritance. During the voyage, he gets to know a woman named Beth Hurwood and her father Benjamin Hurwood, an Oxford professor. Before they arrive, their ship is waylaid by pirates and, with the help of the professor and his assistant, the captain is killed and Chandagnac is forced to join the pirate crew. The reader discovers a sinister plot being concocted by the professor involving his dead wife, his living daughter, the Fountain of Youth, and Blackbeard. Chandagnac, now known as "Jack Shandy", must put a stop to these plans and save Beth Hurwood. It is full of voodoo, zombies, blood, gore, and weird fantasies on the part of one of the bad guys." Well shiver me timbers! Word on the street in Singapore is there be a movin' picture comin' soon with this same title. Now ain't that a coincidence! This summer young Jack Sparrow sails into ONBC waters due to the bounty of Mistress Ann Crispin. She be pennin' a book she's callin' The Price of Freedom tellin' us how Jack Sparrow came to be the plunderin', pillagin' pirate we know and love. Mistress Crispin has generously offered us a sneak peek at said new novel with a Zone exclusive with part o' her writin' about Jack's first bath. Keep a sharp eye on the upper section of the ONBC board for the postin' of her creativity. If you're willin' to sail into dark and dangerous waters, sign on to the ONBC crew this spring and summer or else we be comin' to Shanghai ya'! Re: ONBC 2011 - Pirates! Just now ordered my copy of On Stranger Tides. I feel the sand in the bottle that was Babylon Nights running through my fingers. Too soon we'll be through and you know, that feeling you have to come home from playing, one whole world almost gone in the rearview mirror. Sad. But have to say I'm already impressed about what I've read about Tim Powers writing and I am much looking forward to setting sail. Early March, right? me and books. BTW, not cheap, even my used copy. fireflydances wrote: Just now ordered my copy of On Stranger Tides. I feel the sand in the bottle that was Babylon Nights running through my fingers. Too soon we'll be through and you know, that feeling you have to come home from playing, one whole world almost gone in the rearview mirror. Sad. I am impressed, though, by the quality of the binding, paper, etc for a paper back - perhaps the reason it was a little more pricey than some of the other books I have purchased recently. Well, mine arrived today. Haven't cracked it open yet. I figured the price was related to the fact that the movie is opening. It's all what the market will bear. Had to lay out $49 and change for a USED paperback textbook for my daughter's class. Looking forward to the book however. Just thought I would mention for some of you who were appalled at the price, like I was, that the book seems to be popping up in the libraries. It’s likely due to the film coming out because I tried ages ago when it was first mentioned and my library didn’t have it. Luckily they just got a new copy and I was first in line to read it. I just finished it last night and can see an interesting discussion coming on with this story. Now I just have to keep on my toes so I don't miss the start of the tidbits. Kindle release on April 26 for $6.99, may wait to buy! tndixie wrote: Kindle release on April 26 for $6.99, may wait to buy! The mass market paperback will also be released the same day. Unfortunately, we'll be done with the ONBC discussion by then! I saw that ebook release, too, and thought "Yes!" and then "No!" when I saw the date. The "search" feature on an ebook would be wonderful for an ONBC discussion. How many times have we all wondered just where a quote was? I use that search feature all the time when it's available. I've gotten rather spoiled by it so when it's not there I have to remember to really mark pages.